Need some guidance? Have EcoDirect design you a custom system! Reduce system cost by reducing your overall energy usage. 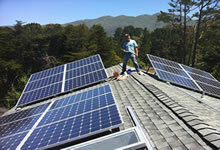 Have a custom solar system designed or select a solar kit. Let EcoDirect help you find an installer in your area. We love this beautiful roof-mounted array made with Canadian Solar panels! There is nothing more beautiful than a sleek, flush mounted system on your roof telling people that you are doing your part for the next generation. In the past few years, the cost of solar has shot down drastically. What was once an option that could only be justified in terms of environmental impact is now a smart investment. Once your solar system is installed, that monthly feeling of dread when the utility bill arrives will be gone. Return on investment (ROI) is reduced even further by government subsidies and tax credits. Does solar seem out of reach? Lowering overall energy use through high efficiency LED lighting, adding an attic fan to your home, and more are affordable solutions that can bring the cost of going solar down. Reducing overall energy use before adding solar to the mix means that fewer panels will offset the same percentage of that overall energy use. EcoDirect offers grid tie kits and custom solutions.